defines a Markov chain, whose stationary distribution (Fig. 1D) provides insight into questions that address the relation between properties of local synaptic processes and the computational function of a neural network. fluctuates between different solutions and moves primarily along the task-irrelevant dimension θ2. takes place in task-irrelevant dimensions. enables the network not only to find in a high-dimensional region with good network performance but also to rewire the network to compensate for changes in the task. We analyze how the strength of the stochastic component of synaptic dynamics affects this compensation capability. We arrive at the conclusion that compensation works best for the task considered here if the stochastic component is as large as in experimental data (Dvorkin and Ziv, 2016). that specifies a particular selection of functional synaptic connections out of the set of potential connections and particular synaptic weights for these defines a concrete neural network, to which we also refer as network configuration. (1) with a positive offset parameter θ0 that regulates the initial strength of new functional synaptic connections (we set θ0 = 3 in our simulations). to the two dPCA components that best explain the variance of the average reward. dpc1 explains >99.9% of the reward variance (dpc2 and higher dimensions <0.1%). A single trajectory of the high-dimensional synaptic parameter vector over 24 h of learning projected onto dpc1 and dpc2 is shown. Amplitude on the y-axis denotes the estimated average reward (in fractions of the total maximum achievable reward). After converging to a region of high reward (movement mainly along dpc1), network continues to explore task-irrelevant dimensions (movement mainly along dpc2). scales the strength of this stochastic component in terms of a “temperature” T and a learning rate β and is chosen to be of a form that supports analogies to statistical physics. The presence of this stochastic term makes it unrealistic to expect that θi converges to a particular value under the dynamics defined by Equation 2. In fact, in contrast to many standard differential equations, the stochastic differential equation or SDE (Eq. 2) does not have a single trajectory of θi as solution but an infinite family of trajectories that result from different random walks. that can be clearly related to reward expectation for the neural network, and hence to its computational function. reaches its global maximum, as in simulated annealing (Kirkpatrick et al., 1983). (4)where ∝ denotes proportionality up to a positive normalizing constant.
. Hence, our model (Eq. 5) is consistent with previous Ornstein–Uhlenbeck models for spontaneous spine dynamics. , illustrated in Figure 1D, approximately reaches its maximal value. This provides on the statistical level a guarantee of task performance, despite ongoing stochastic dynamics of all the parameters θi. (Fig. 1B) and the prior (Fig. 1C). , we recover for the case θi > 0 deterministic policy gradient learning (Williams, 1992; Baxter and Bartlett, 2000; Peters and Schaal, 2006). 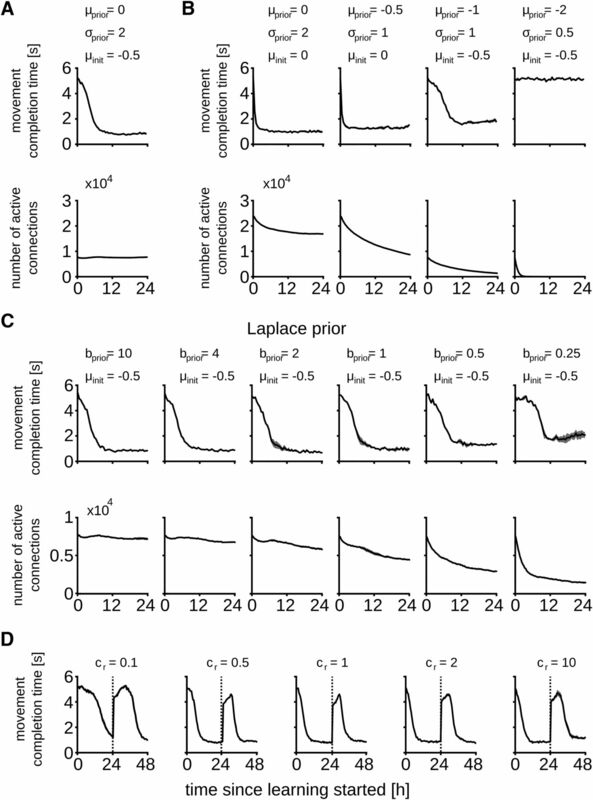 gives rise to synaptic updates at a synapse i that are essentially given by the product of the current reward signal r(t) and an eligibility trace that depends on pre- or postsynaptic firing times (see Materials and Methods, Synaptic dynamics for the reward-based synaptic sampling model). Such plasticity rules have previously been proposed (Seung, 2003; Xie and Seung, 2004; Pfister et al., 2006; Florian, 2007; Izhikevich, 2007; Legenstein et al., 2008; Urbanczik and Senn, 2009). For nonspiking neural networks, a similar update rule was first introduced by Williams and termed the REINFORCE rule (Williams, 1992). (Fig. 1D,F). Hence this type of reinforcement learning samples continuously from a posterior distribution of network configurations. This is rigorously proven in Theorem 1 of Methods. We refer to this reinforcement learning model as policy sampling, and to the family of reward-based plasticity rules that are defined by Equation 5 as reward-based synaptic sampling. with mean 0 that encodes a preference for sparse connectivity (Eq. 17).
. This results in a distribution over waiting times between downwards and upwards crossing of the threshold θi = 0 that was found to be similar to the distribution of inter-event times of a Poisson point process (for a detailed analysis, see Ding and Rangarajan, 2004). This theoretical result suggest a simple approximation of the dynamics of Equation 5 for currently nonfunctional synaptic connections, where the process of Equation 5 is suspended whenever θi becomes negative, and continued with θi = 0 after a waiting time that is drawn from an exponential distribution. As in Deger et al. (2016), this can be realized by letting a nonfunctional synapse become functional at any discrete time step with some fixed probability (Poisson process). We have compared in Figure 3C the resulting learning dynamics of the network for this simple approximation with that of the process defined by Equation 5.
was modeled as Poisson spike trains from the 200 input neurons with instantaneous rates defined by two prototype rate patterns P1 and P2 (Fig. 2H). The task was to learn to activate T1-projecting neurons and to silence T2-projecting neurons whenever pattern P1 was presented as cortical input. For pattern P2, the activation should be reversed: activate T2-projecting neurons and silence those projecting to T1. This desired function was defined through a reward signal r(t) that was proportional to the ratio between the mean firing rate of MSNs projecting to the desired target and that of MSNs projecting to the nondesired target area (see Materials and Methods). kept moving at almost the same speed even after a high plateau of rewards had been reached. Hence these ongoing parameter changes took place in dimensions that were irrelevant for the reward-level. 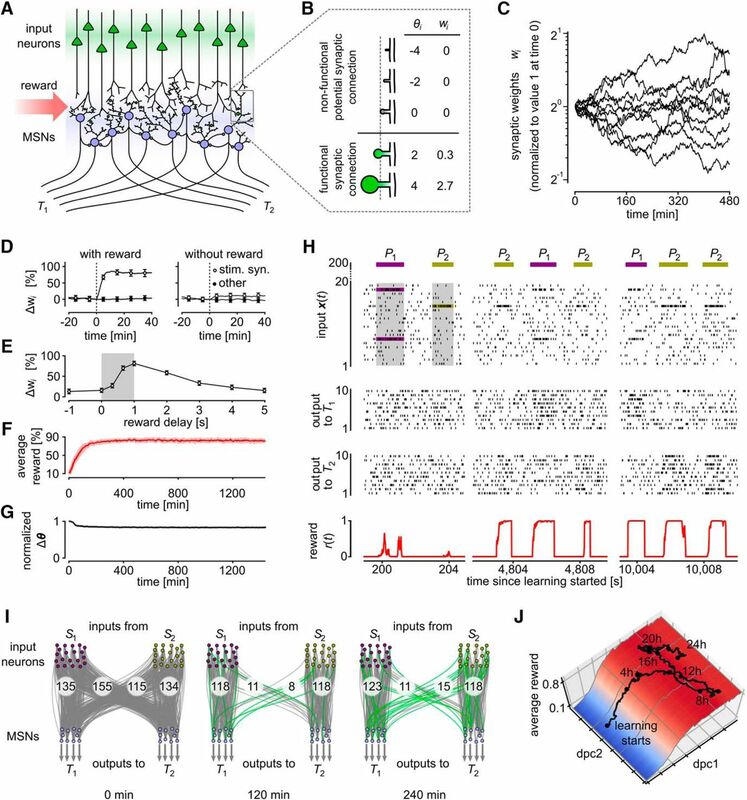 , we took a generic recurrent network of excitatory and inhibitory spiking neurons with connectivity parameters for connections between excitatory and inhibitory neurons according to data from layer 2/3 in mouse cortex (Avermann et al., 2012). The network consisted of 60 excitatory and 20 inhibitory neurons (Fig. 3A). Half of the excitatory neurons could potentially receive synaptic connections from the 200 excitatory input neurons. From the remaining 30 neurons, we randomly selected one pool D of 10 excitatory neurons to cause downwards movements of the lever, and another pool U of 10 neurons for upwards movements. We refer to the 40 excitatory neurons that were not members of D or U as hidden neurons. 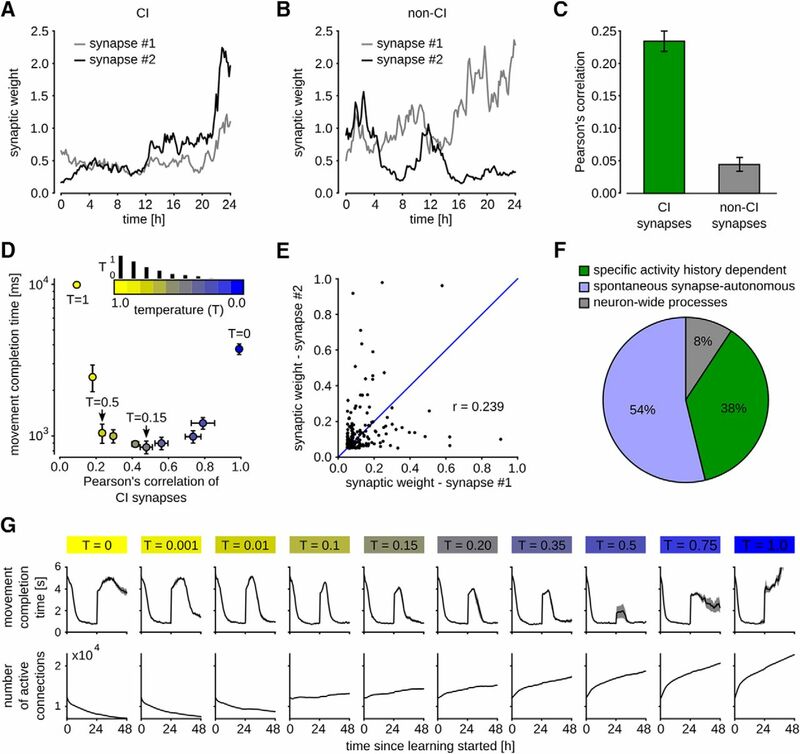 All excitatory synaptic connections from the external input (cue) and between the 60 excitatory neurons (including those in the pools D and U) in the network were subjected to reward-based synaptic sampling. to stabilize the synaptic parameters. After four simulated days we set the mean of the before the current value of the synaptic parameters and reduced the variance, while continuing the synaptic dynamics with the same temperature. A similar mechanism for synaptic consolidation has been recently suggested previously (Kirkpatrick et al., 2017). This mechanism reliably prevents forgetting in our model throughout the simulation time of 14 d. We conclude that the effect of forgetting is quite mild in our model and can be further suppressed by a consolidation mechanism that stabilizes synapses on longer timescales. to migrate to a new region within ∼8 h of continuing learning (see Materials and Methods the projected parameter dynamics is further analyzed). Again, we observe that policy sampling keeps exploring different equally good solutions after the learning process has reached stable performance. for active synaptic connections. A similar mechanism for synaptic weight decay was used previously (Rokni et al., 2007). Convergence to sparse connectivities is faster with this prior and good task performance can be reached by networks with less active connections compared to the Gaussian prior. For example, the network with b = 2 solved the task in 0.66 s on average using roughly 5700 active connections, whereas the best solution for the Gaussian prior was 0.83 s on average with typically >7500 active connections. Again, for the Laplace prior, parameters that enforced too sparse networks degraded task performance. , for T = 1, our model suggests to view reward-gated network plasticity as Bayesian inference over network configurations on a slow time scale (for details, see Materials and Methods, Probabilistic framework for reward-modulated learning). For a temperature parameter T ≠ 1, the model samples from a tempered version of the posterior, which generalizes the basic Bayesian approach. This Bayesian perspective also creates a link to previous work on Bayesian reinforcement learning (Vlassis et al., 2012; Rawlik et al., 2013). We note however that we do not consider parameter adaptation in our framework to implement full Bayesian learning, as there is no integration over the posterior parameter settings to obtain network outputs (or actions in a reinforcement learning context). Even if one would do that, it would be of little practical use, since the sampling would be much too slow in any but the simplest networks. The experimental data suggest for the intermediate algorithmic level of the Marr hierarchy a strong reliance on stochastic search (“synaptic sampling”). The essence of the resulting model for reward-gated network learning is illustrated in Figure 1. The traditional view of deterministic gradient ascent (policy gradient) in the landscape (Fig. 1B) of reward expectation is first modified through the integration of a prior (Fig. 1C), and then through the replacement of gradient ascent by continuously ongoing stochastic sampling (policy sampling) from the posterior distribution of Figure 1D, which is illustrated in Figure 1E,F. that results from large numbers of local stochastic processes at the synapses provides a time-invariant perspective of salient properties of a network. Standard reward-gated plasticity rules can achieve that this stationary distribution has most of its mass on regions in the parameter space that provide good network performance. The stochastic component of synaptic dynamics can flatten or sharpen the resulting stationary distribution, depending on whether the scaling parameter T (temperature) of the stochastic component is larger or smaller than 1. 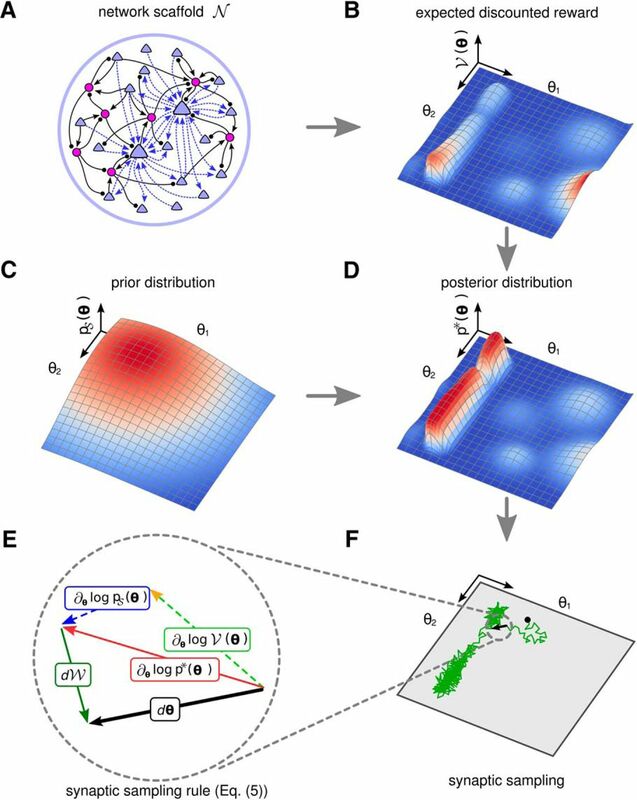 A functional benefit of this stochastic component is that the network keeps exploring its parameter space even after a well-performing region has been found, providing one mechanism to tackle the exploration-exploitation dilemma (Fig. 2J). This enables the network to migrate quickly and automatically to a better performing region when the network or task changes. We found in the case of the motor learning task of Figure 3 that a temperature T around 0.15, which lies in the same range as related experimental data (Fig. 5D), suffices to provide this functionally important compensation capability. 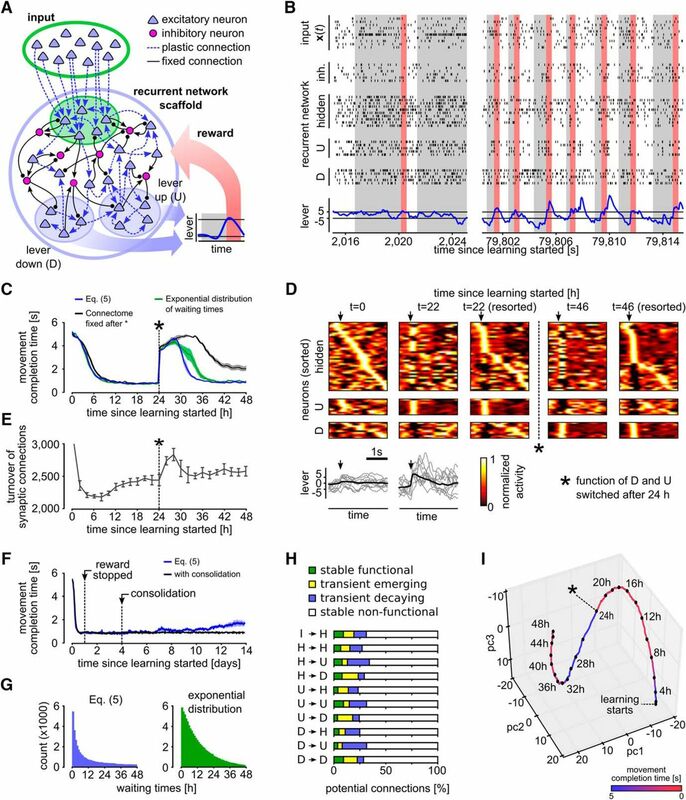 The same mathematical framework can also be applied to artificial neural networks, leading to a novel brain-inspired learning algorithm that uses rewiring to train deep networks under the constraint of very sparse connectivity (Bellec et al., 2017). can also include influences of network initial conditions by assuming some distribution over these initial conditions. Network initial conditions include for example initial values of neuron membrane voltages and refractory states of neurons. 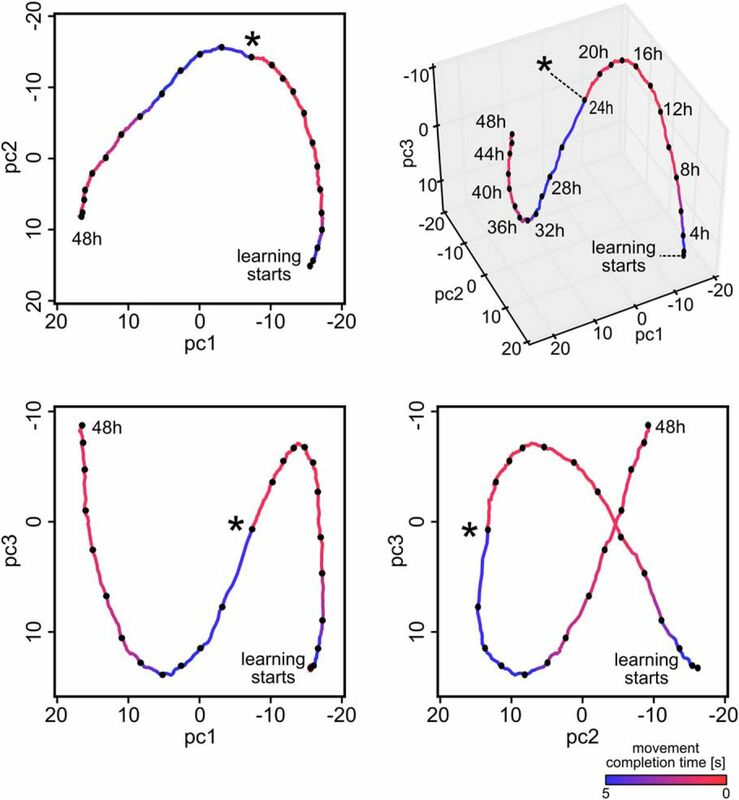 The role of initial conditions on network learning is further discussed below when we consider the online learning scenario (see Reward-modulated synaptic plasticity approximates gradient ascent on the expected discounted reward). under the constraint that the abstract learning goal vb = 1 is achieved. which are more uniformly distributed than the posterior. is a stationary distribution of the parameter sampling dynamics Equation 9. Since β is strictly positive, this stationary distribution is also unique (see Section 3.7.2 in Gardiner, 2004). becomes 0, which completes the proof.
. Potential synaptic connections are also indexed in an arbitrary order by integers between 1 and Ksyn, where Ksyn denotes the number of potential synaptic connections in the network. We denote by prei and posti the index of the pre- and postsynaptic neuron of synapse i, respectively, which unambiguously specifies the connectivity in the network. Further, we define synk to be the index set of synapses that project to neuron k. Note that this indexing scheme allows us to include multiple (potential) synaptic connections between a given pair of neurons. We included this experimentally observed feature of biological neuronal networks in all our simulations. We denote by wi(t) the synaptic efficacy of the i-th synapse in the network at time t.
, with time constants τm = 20 ms and τr = 2 ms, if not stated otherwise. Here * denotes convolution and Θ(⋅) is the Heaviside step function, i.e., Θ(x) = 1 for x ≥ 0 and 0 otherwise. was initialized at -3 and then followed the dynamics given in Equation 13. We found that this regularization significantly increased the performance and learning speed of our network model. In Remme and Wadman (2012), a similar mechanism was proposed to balance activity in networks of excitatory and inhibitory neurons. The regularization used here can be seen as a simplified version of this mechanism that regulates the mean firing rate of each excitatory neuron using a simple linear control loop and thereby stabilizes the output behavior of the network. denotes the PSP under synapse i.
of the postsynaptic neuron is already close to one. , the effect of the neuromodulatory signal r(t) will be >1. On the other hand, if the current reward is below average synaptic updates will be weighted by a term significantly lower than 1. Therefore, parameter updates are preferred for which the current reward signal exceeds the average. from back-propagating action potentials in the synapses has been proposed. The main difference to these previous approaches is that the activity-dependent last term in Equation 15 is scaled by the current synaptic weight wi(t). This weight-dependence of the update equations induces multiplicative synaptic dynamics and is a consequence of the exponential mapping Equation 1 (see derivation in the next section). This is an important property for a network model that includes rewiring. Note, that for retracted synapses (wi(t) = 0), both ei(t) and gi(t) decay to zero (within few minutes in our simulations). 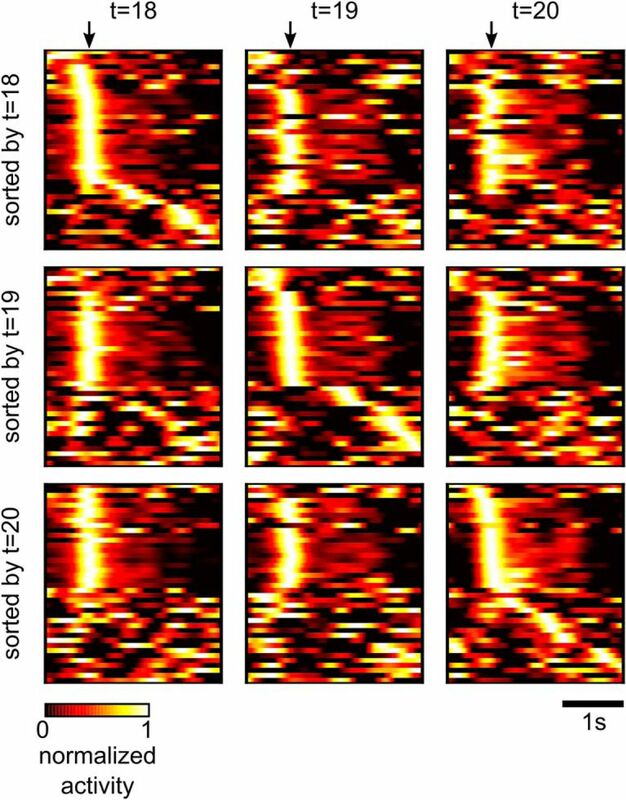 Therefore, we find that the dynamics of retracted synapses is only driven by the first (prior) and last (random fluctuations) term of Equation 5 and are independent from the network activity. Thus, retracted synapses spontaneously reappear also in the absence of reward after a random amount of time.
. The temperature T and the standard deviation σ scale the contribution of these two forces. depends on the parameter θi. If one discretizes time and assumes that rewards and parameter updates are only realized at the end of each episode, the REINFORCE rule is recovered (Williams, 1992). (without the jump at θi = 0), for which Equation 21 is exact, and found that this yields results that are not significantly different from the ones that use the mapping Equation 1.
. In a biological setting, there are typically no clear episodes but rather a continuous stream of network inputs and rewards and parameter updates are performed continuously (i.e., learning is online). The analysis of online policy gradient learning is far more complicated than the batch scenario, and typically only approximate results can be obtained that however perform well in practice (for discussions, see Seung, 2003; Xie and Seung, 2004). estimates the expected discounted reward through a slow temporal average. (25)for any constant α (cf. Williams, 1992; Urbanczik and Senn, 2009). should be on the same order as the time constant τg for estimating the gradient. We selected both to be 50 s in our simulations. Simulations using the batch model outlined above and the online learning model showed qualitatively the same behavior for the parameters used in our experiments (data not shown). , where ν0 = 25 Hz is a soft firing threshold and S(⋅) denotes the logistic sigmoid function. The reward was recomputed every 10 ms. During the presentation of the background patterns no reward was delivered.
. After four simulated days, we set μi to the current value of θi for each synaptic parameter and the standard deviation σ was set to 0.05. Simulation of the synaptic parameter dynamics was then continued for 10 subsequent days.